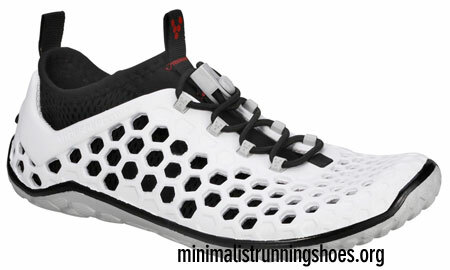 I think I have found my next pair of running shoes. The only problem is that they haven't come out yet - but they are due to be released this month. Apparently they are noticeably lighter than the Evos and the Neos (which I have and like very much). The first obvious thing to notice about them is that they have holes in, rather like Crocs. The idea is that you wear them with an optional mesh sock which comes supplied. They look just the ticket for Triathlon. Any water (or sweat, for that matter) should drain out and the holes should keep your feet cool. From a review I've read, the soles are a bit more bouncy and less stiff than the soles of the Neos and could be less durable and absorb more of the impact (which, if you've been reading my blog, you will know is a bad thing). Still, they could potentially be the best shoes for competition; for training I like to run in tougher shoes with a crisper, more snappy sole. As soon as I can get my hands on a pair, I'll let you know how they are.